For those newly joining Zoe Memes, Zoe in Greek means “life.” I have a recurring set of characters in my life, one of which is our lazy old fat worthless cat. Dang I love this cat! She was born about 20 feet to the left of this picture in our bathroom, circa 2005-ish. She loves tuna, anything to do with tuna. She used to be quite the hunter, leaving regular surprises at our front and back door only identifiable by fur, or a tail, or feathers. She’s getting older now and rather lazy. With her advancing age she has slowed down some and her belly has grown … um… HUGE?! I’m sitting on the couch and look to my left and this is what I see. This cat is so rotten. Does that look comfortable to you? Could she possibly be happy? Her belly MUST be pushing into her diaphragm, making it hard to breath. I mean, this cat has such a belly full of TUNA that there is no way that could be comfortable. She was purring so loudly it was obnoxious. She remained sprawled out for some time on the couch, purring, and appearing like she was in kitty-cat heaven on the human’s fluffy couch. I have to say, I was astonished. 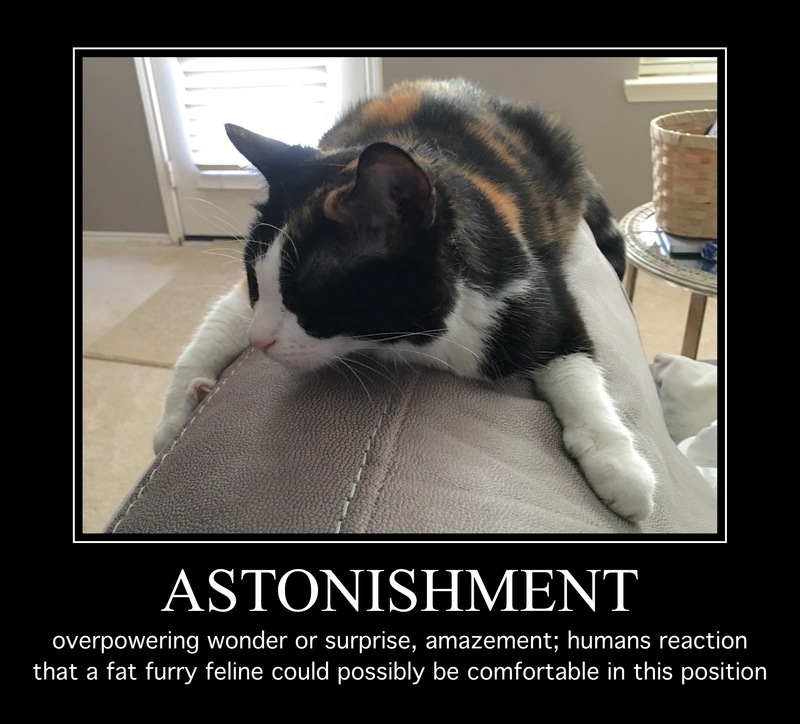 This entry was posted in Callie, cat, happy, Home, humor, joy, lazy, love, Meme, Uncategorized and tagged astonishment, calico, spoiled, Zoe. Bookmark the permalink.